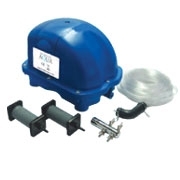 Including aerator pump with 200 l/h at 4 watt. Including aerator pump with 1800 l/h at 25 watt. With 4x 5 m air hose, 4 air stones & adjustable air valves. 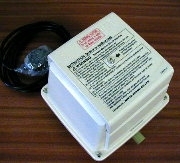 The KA25 is a high output airpump designed for koi ponds. It can feed 6 50mm diameter airstones to a depth of 2.2m, producing 25 l of air per minute. Power consumption: 20W. 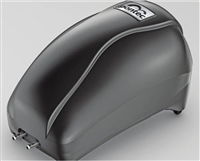 The KA50 is a high output airpump designed for koi ponds. It can feed 12 50mm diameter airstones to a depth of 3m, producing 50 l of air per minute. Power consumption: 40W. 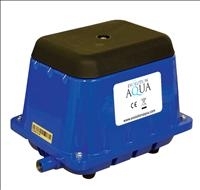 This air pump by Evolution Aqua delivers 70ltrs per minute and is ideal for use with The Qube filtration system. It comes as a kit with airstones, airline and valves. It can be used outside but is best kept sheltered. 34W. Including aerator pump with 3600 l/h at 35 watt. Piston driven air pump for durability and performance. Delivers 45l per min. 47W. 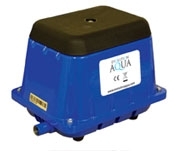 This air pump by Evolution Aqua delivers 95ltrs per minute and is ideally suited to the Nexus 220. It can be used outside but is best kept sheltered. 62W. 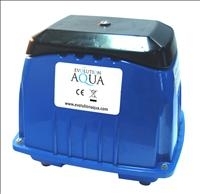 This air pump by Evolution Aqua delivers 130ltrs per minute and is ideally suited to the Nexus 320. It can be used outside but is best kept sheltered. 88W.